Scholarship is a core priority for the Pacific McGeorge faculty. 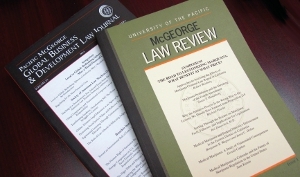 Among their scholarly pursuits, Pacific McGeorge faculty develop and present at scholarly symposia and conferences, author books for the legal profession, students, and the general public, and produce scholarship for top journals around the country and the world. Informed Consent in Mediation: Promoting Pro Se Parties’ Informed Settlement Choice While Honoring the Mediator’s Ethical Duties, Michael T. Colatrella Jr.
A “Lawyer for All Seasons”: The Lawyer as Conflict Manager, Michael T. Colatrella Jr.